The authorities in Tacloban City, capital of Leyte Province in central Philippines, have concluded a mass burial of unidentified bodies retrieved from the debris left by Typhoon Haiyan. In a report published on 7 January, the National Disaster Risk Reduction and Management Council (NDRRMC) estimated that the category 5 storm had killed more than 6,100 people, and another 1,700 are registered as missing. Some 5,000 deaths occurred in Leyte Province. In the days immediately after the typhoon, dead bodies littered the streets. Dogs roamed, gnawing on human flesh. Residents are still chilled by the memory and cover their eyes in horror when they recall it. With most facilities destroyed or damaged, local authorities and survivors struggled to tend to the needs of the living in the devastated region. A government psychiatrist walked and, when roads became passable, cycled 10km daily to meet patients who could get to the Eastern Visayas Regional Medical Centre. Rainwater has had to be pumped out of burial grounds to prevent the body bags from floating. Two government ministries tried to work out where and what was required to bury more bodies than anyone had expected, Tacloban city's mayor, Alfred Romualdez, told IRIN on 5 January, when burials were taking place for the second day. Some 1,400 bodies have been recovered but not claimed in the city so far. "Where we expected to recover 20 bodies a day going into Christmas [six weeks after the typhoon hit], we were finding 70 to 80. We are still recovering bodies,” he said. When bodies were first retrieved, up to one week after the typhoon struck in some places, they were haphazardly buried in mass graves. Some were examined, tagged and logged, some were not. "We left after five days because we could not endure the stench of the cadavers"
“We left after five days because we could not endure the stench of the cadavers,” said Maria Portia Garcia, who lives in Anibong village, 12km from Tacloban. Her sister died when a ship slammed into the home where she was sheltering, a few hundred metres from the shore. She was buried in a mass grave in San Isidro, a community on the outskirts of Tacloban, two weeks after the typhoon. Her body is one of hundreds that have been "processed", as forensics experts call it and laid to rest temporarily in a seven-hectare plot in a nearby cemetery, purchased by the local government in the village of Basper. Processing involves tagging bodies, fingerprinting and photographing them, and collecting DNA samples when possible. The information is analysed after reference samples are gathered from the next of kin, which can take months, depending on the number of cadavers. The bodies will be exhumed later for further identification. “We did not see her body when it was pulled out [of the debris], but we know she is buried now, which brings us some relief,” said Garcia. The Department of Health (DOH) implements national policy on the management of dead and missing persons during emergencies and disasters. The Philippine Department of Justice’s National Bureau of Investigation (NBI) is using protocols developed by Interpol, the international police agency, called disaster victim identification (DVI), which borrows from the forensic science used in criminal investigations. As officials in the Philippines rushed between tending to the living as well as the dead, criticism grew that victim identification was too expensive and, for a grieving public, too time consuming. The World Health Organization (WHO) and the DOH worked with international forensics expert Stephen Cordner to implement an abbreviated DVI method, developed by the WHO and the International Committee of the Red Cross (ICRC), which overlaps with the Interpol method but stops short of immediate DNA sampling. “With mass casualties on the scale that we’ve seen here, it is difficult to do a full identification in a timely manner. With this information [using abbreviated DVI method], we can identify about 50 percent of bodies,” said Julie Hall, the WHO representative in the Philippines. This method relies heavily on visual recognition, which may not always be accurate, but cases in doubt can be resolved by DNA sampling, said Hall, who noted that both forensic methods were used after Typhoon Haiyan. Antonio Vertido, chief medico-legal officer of the NBI, defended the government’s slow pace. “We cannot abbreviate the process because [it follows] international... [protocol]. As much as we’d like to abbreviate the process - we are tired, too - we can’t,” he told IRIN while overseeing a recent mass burial. Garin called for the formation of a decision-making body on natural disasters similar to the US Federal Emergency Management Agency to help resolve such disputes. The country's president appointed parliamentarian Panfilo Lacson in December 2013 to oversee and coordinate the government agencies involved in rehabilitation efforts, and to manage typhoon-related spending. Lacson has echoed Garin’s call for centralized decision-making after disasters. 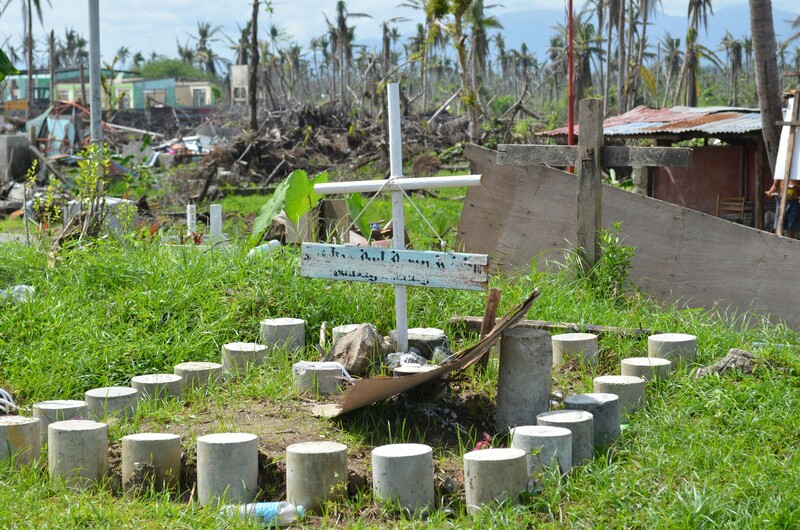 All four of Ferdinand Quieta's children died when Typhoon Haiyan slammed into their home 2km from the coastline in Tanuan in Leyte Province. “For people here, just like in other countries, the way a body is treated and buried is very important,” said Lynne Jones, mental health officer of International Medical Corps, who helped write the mental health guidelines for the Inter-agency Standing Committee (IASC), which coordinates UN and non-UN international humanitarian agencies, speaking from the Philippines.